As I worked on the image for this year's Samhain greeting using the remains of a sunflower leaf, I thought of the step book I made about the sunflower to illustrate its taxonomy, which wikipedia defines as "the science which deals with the study of identifying, grouping, and naming organisms according to their established natural relationship." 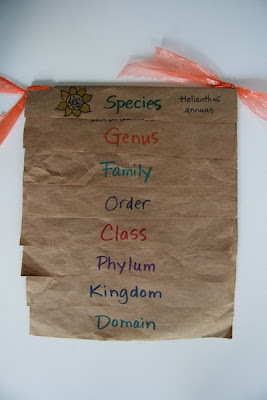 My mother-in-law taught me the importance of Latin names in gardening and I enjoy learning the names of individual plants and their families. I used three panels from the front and back of grocery bags for the pages and strips cut from a plastic bag for the ties. This month's giveaway will be a CD about the Spirit Books. Look for it next week on Book Arts Tuesday.